Ravi Chaudhry is a strategy consultant to corporations, governments and civil society, mentor to CEOs and corporate boards, author, public intellectual, and Fellow, World Business Academy, a network of global thought leaders that represent some of the best and brightest men and women shaping today’s landscape. A recipient of Ambassador of Knowledge Award, he is often referred to as a leadership guru. He is the founder Chairman of CeNext Consulting & Investment Pvt Ltd, New Delhi. Prior to that, he was Chairman of four companies in the Tata Group, India. 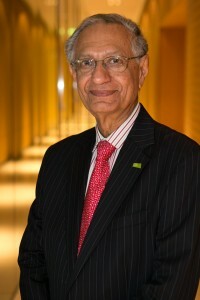 His clients include several Fortune 1000 corporations, including BASF and BMW (Germany), DHV (Holland), Sunstar (Japan), Sabanci Group (Turkey), Domino Sciences (U.K.), Perfetti (Italy), numerous Indian business groups, and many others in financial services, life sciences, automotive, infrastructure, food and agriculture, packaging, real estate, mines and minerals, engineering and electronics, and luxury goods sectors. He has been an advisor to Governments of Switzerland, Turkey, Brazil and Norway, and has done many assignments for multilateral organizations (UNIDO and World Bank), think-tanks and universities, as well as Governments of Austria, Argentina, Canada, Germany, the Netherlands and Uganda. He is a mechanical engineer, with decades of experience in managing factories, setting up new plants, and international marketing. He specializes in “Rethinking Global Strategy and India’s Role”, and “Strategy Re-alignment” to bridge the gap between performance and potential. An astute observer of the emerging global trends, he is a frequent invitee to corporate strategy retreats and leadership renewal programmes, where he reviews the current state of the global economy and concludes with his observations on the matrix of strategic options in the years ahead. He is an outstanding motivator and has singly conducted several board level dialogues on themes such as ‘Re-inventing Leadership to Cope with Future’, and ‘Mindfulness – the trait that bridges the gap between Achievement and Potential’. His single-faculty programmes typically last half-day to full–day. Equally often, these are spread over two-days, often followed by a one-to-one meeting with each participant. Ravi Chaudhry has addressed major global conferences as keynote speaker, session chairman, panel moderator as well as lead discussant. He has conducted on-stage interviews with several business leaders and thought leaders, and has also been interviewed by many of them (including at IMD Lausanne and Conference Board USA events). He is a much sought-after speaker on Corporate Governance, Innovation, Morality and Values, and Sustainable Equitable Growth. In recent past, he has delivered lectures at Global Economic Summit at Kiel, Germany; First Round Table Dialogue, Berlin; IMD Switzerland; Club of Rome Annual Meeting; Institute of Directors World Congress; Asian Strategy and Leadership Forum Summit, Kuala Lumpur; CII Partnership Summits; National Conference on Governance, New Delhi; India-Pakistan Management Summit in Lahore and Ethical Leadership Conference, Ljubljana. He has been on the Boards of several companies and institutions. He continues to be International Board Director, Future 500 USA, Co-Chair, EthicMark® Judges Panel, USA, and Member, EVIAN Brains Trust at IMD Switzerland; New Civilization Youth Entrepreneurship Initiative, Japan and Executive Committee of Federation of Indian Chambers of Commerce and Industry. He has also been a part the Club of Rome Initiative for Ethics in the 21st century. He lives in New Delhi and devotes most of his time to foster the process of responsible leadership. For him, good governance is a passion. He is now writing a book that deals with issues on “How to Govern a Nation?” and the role of business leaders in fast-tracking responsible leadership.